I have a really good friend who likes crafts and art. We always give each other handmade gifts and it's a big problem for me figuring out what to give her. In the past I have made for her mini albums, frames, a magnet board and other home décor pieces but this time I was stuck. I finally decided to try something new. I love quilling, I like to embellish my cards with it and even my layouts, but I wanted to see if I can embellish a box with it. First, I covered a wooden box with two coats of acrylic paint. Then I created my quilling shapes and adhered them to the box. My main problem was how to make sure that the quilling shapes would last. 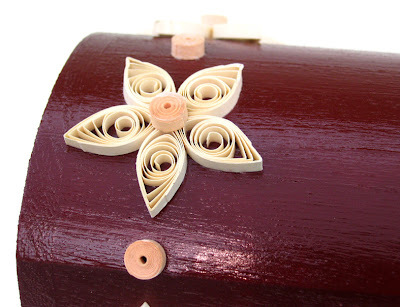 A box is something that is displayed and needs to be cleaned, and quilled shapes are very gentile. My solution was liquid lacquer spray. 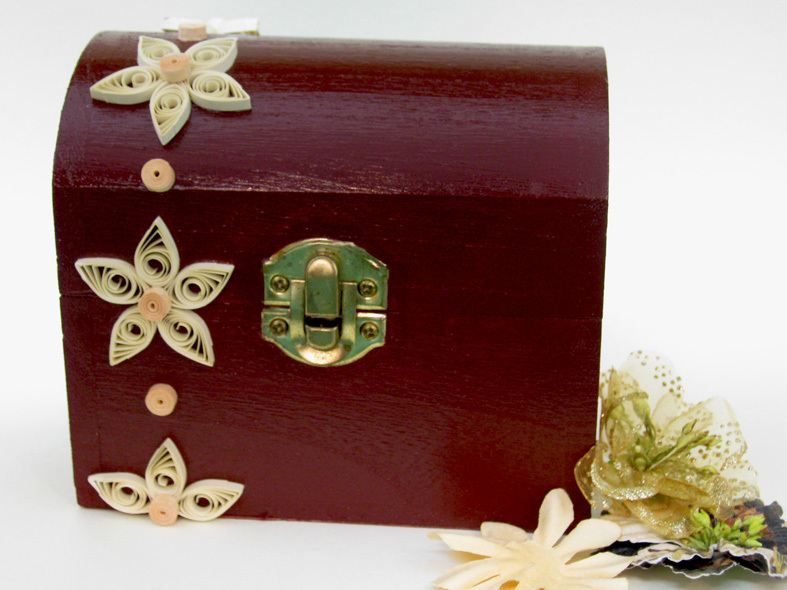 I sprayed the box with the quilling on it. After it dried, the spray gave the box a beautiful glossy finish and hardened the paper. What a discovery! By the way, my friend loved it!! הקווילינג שלך מדהים ואכן רעיון גדול להדביק את זה על קופסא. יצא מקסים! I'm sure she loved it, it's so pretty! Wow! I'm sure she love it!! I just discovered quilling myself a few weeks ago at a free Make & Take at Archivers. It was so much fun! I really wasn't expecting to like it but I did! Now to buy all the quilling items. I never thought to quill on anything other than paper... very smart to think of the liquid lacquer spray. TFS!